So I watched this last night after a g/f called me and told me it was going to be broadcast. Firstly, I hate that people try to have designer babies and these people sicken me. Secondly, this news story seemed to put a negative twist on egg donation based on bureaucratic laws as decided by ignorant members of Parliament in 2004. I really feel if a consenting woman chooses to offer up her eggs to an infertile opportunity, whatever the motives, she is still a consenting adult and government should not be the decision maker. I also wonder why the media wastes time on these kind of stories as there really was not a positive message, more a negative and criminal overtone. It is a shame that we have to be judged in life based on out infertility and that our actions to create a family can be considered criminal. The interview with the 4 time surrogate mom who made light of how she mustered up receipts for payment to cover off the loop hole of commercial surrogacy also made me feel as if she was making a mockery of it. I am sure she is unaware that her fluffy attitude could easily turn on the parliamentary bells and engage the government in a manner that would not benefit anyone using a surrogate in Canada. Sadly, this is the reality of the world we live in, where government decides what we can and cannot do to have a family, yet they will sell me alcohol and cigarettes which have possible intent to harm or kill. Yay for 8 weeks!! Baby is measuring at 8 weeks , 16mm which is just slightly ahead of actual dates (all normal). Heartbeat is 171 bpm and we can actually see baby shape in the ultrasound pics!!! Many of you have come up with great nick names for your growing baby like Bubble, baby WAM, peanut etc., and since I love that damn talking gopher, its has been collectively decided that our growing baby will be called Alan. Yes, Alan. We know this baby could be a girl, but the humour in the name of Alan suits us too well. Ok, I am slightly obsessed with this bugger. Blood ozone..not for those who cannot stand the site of blood. Friday night Mark reached to the tap to turn it on and threw his back out. Saturday morning he was crippled with pain. Luckily we had appointments at our ND's for ozone treatment so we knew he could get some help when we were there. We both had out treatment then Dr Srajeldin gave Mark some premium back care services. Mark spent about 45 minutes having the doctor work on him. He did an assessment, found the spasms and worked on them manually, then we did ultrasound treatment, then some chiro adjustments. The adjustments were very painful for Mark but by 8 pm Saturday evening he was out of pain and walking normally. We are very fortunate to have this doctor in our lives!! Some of you have asked what Blood Ozone is, so I took a few pictures to show you. 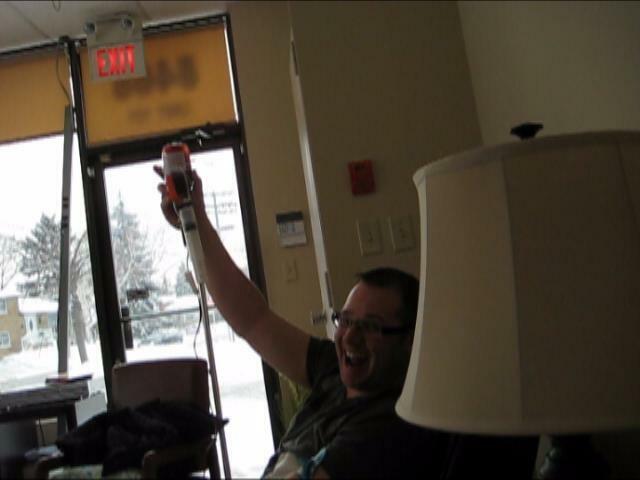 Step one: An IV in inserted and a line hooked up to a sterile glass bottle. 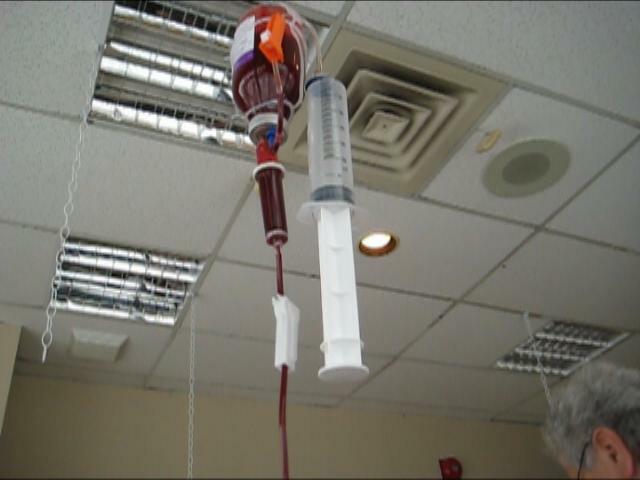 The line is set up in reverse mode to withdraw blood. This picture shows my arm with my blood flowing out into the line. Here is my blood ﻿flowing into the glass bottle.... Mark is sitting across the room from me in is sweats managing thru his pain, and a bit squeamish at the site of blood. Once enough blood has filled the bottle, the bottle is turned upside down and put back into your body. As the blood slowly enters your body, the doctor inject its with Ozone gas. As you can see, my blood is now in the bottle, upside down and the larger syringe contains ozone gas that enters the additional line on the apparatus. But the doc had a little fun with Mark and made him hold it up like a beer... Cheers! Why oh why would we do this you ask??? Well, for me, it is a good way of detoxing after all the IVF drugs and also after being sick for such a long time. Fortunately, the benefit of adding lots of oxygen to Marks system via his blood minimized his healing time.﻿ The royal family (yes the Queen) does this treatment once a week and they all tend to have very good health. It's not for everyone - we get it, but for us the results are noticeable and well worth it. Post nasal drip, 7 weeks and snow. It is hard for us to believe we are entering our 7th week. Surreal indeed. I am not sure what is going on, but I am in a constant state of cold/sick. For the first time in my life I am dealing with post nasal drip - so disgusting! I went to my Naturopath yesterday for blood ozone and he gave me a secondary injection of echinacea. The administration of echinacea is quite cool - it is like a sub q injection but goes directly under the skin. The fluid make a small bubble under your skin and slowly your body absorbs it. About twenty minutes after this I started with mouth fulls of post nasal crap. The injection is really causing major sinus drainage, which is a good thing. Mark has never had an ozone treatment so we are going to see if we can get in on Saturday - I promise pictures if we can get an appointment! We got hit with some lake affect snow on Wednesday and ended up with about 10cm's of the glorious flakes from above. I proudly used the snow blower before work, and had a chuckle as the home reno crew next door (all boys) watched in amazement! To help kill time, we have painted our guest bedroom, painted our master bathroom and this weekends project is a complete redesign of our walk in closet. Since the news of a positive the world has changed a little for us (as you can imagine). We are optimistic that we will have a successful pregnancy, yet realistic that anything can happen. 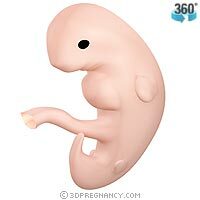 Once we hit ten weeks and our embryo is now considered a baby we will feel relief making it to this point. Mini milestones are critical in this journey, and we have hit a few, survived and continue onward. 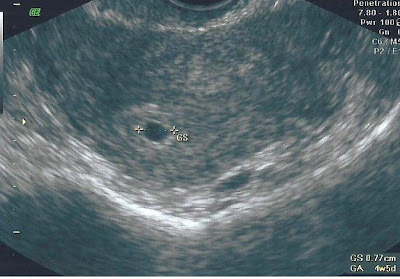 Since Jeff and Kevin mentioned that our ultrasound "looks just like ya" I figured I would put up a picture of our growing baby and see if anyone agrees lol!! 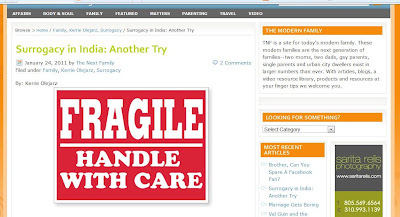 How ironic is it that we are FINALLY pregnant and our nextfamily.com blog recalls the challenges of getting to this point. It feels weird to be posting the great news of our heartbeat and the same day reading about our challenges along the way. Maybe ironic is not the word, but at 6:30 am its what I came up with. Re-reading it does remind me of how important you have all become in our lives and how your love and support never wavered. 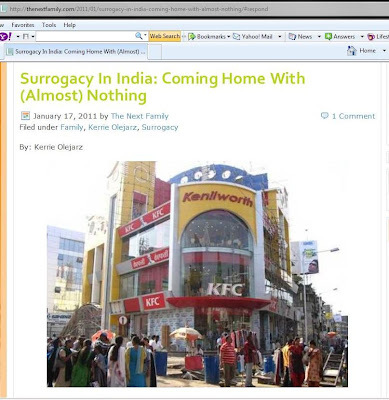 We are very fortunate and grateful to be part of this international surrogacy community. ps..we are 6 weeks pregnant! With great relief we awoke to 4 scan pics showing us our wee ones heartbeat! Baby measures 5 weeks 6 days which is exactly where we should be. In the scan pics we can also see our curled up little one (last scan looked like an empty sac and now we can see life there). The fetus now has a CRL measurement where as last time our measurement was for the sac. Ah! What a great feeling!!!! All is looking good so far!! Next scan is in two weeks and we can't wait!! Feel like peeing your pants?? Vial number four, the haunting! If you know our story or have read our blog header, you know that we lost a shipment of embryos back in July 2009. The devastation is recounted in this weeks update on thenextfamily.com As I wrote this and read it today it still sends a haunting chill through my body. Fortunately, this was a rare circumstance and less than a year later the manufacturer took care of us and made improvements to their product. Here he or she is, all 7.7 mm's. All is well according to Dr Shivani so we just can't be more pleased! !